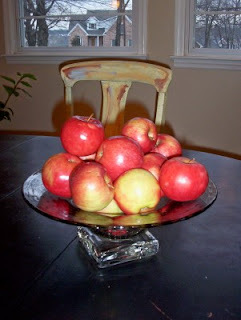 I always fill this handblown glass bowl with rosy red apples for Valentine's Day, adding a few snips of greenery on the big day. Red Delicious apples have a natural heart-like shape, but I don't like the taste. This year Kroger has a 5 pound bag of Jonagolds on sale for $2.50. A big bag of apples makes for cheap color and, as they say here in Tennessee, good eatin', too. Those wouldn't last until Valentine's Day at our house. Yummy!!! We came upon Jonagolds first last fall and our family loves them! !